There is one reason and one reason only that senior CSIRO managers would use private email and that is to avoid legal and public scrutiny of decisions which they know they would never otherwise be able to justify. The CSIRO has invested a considerable amount of money in its Records Management Systems and CSIRO policy (unless management decides to change it on a whim) requires that all employees, irrespective of seniority enter any and every record ( and that includes emails) into the record management system. In fact the CSIRO email system is set up to do just that, sweep the contents of official emails into the Records Management System. The author of this post spent a considerable period of time working within the CSIRO’s Records Department and knows their processes well. Quite simply put, a record is any document, discussion, email meeting minute and so on and so forth generated by ANY CSIRO officer in the course of undertaking their appointed duties. I am sure there is a Records Manager out there who will be able to provide a better definition but for the purposes of this post such a definition will suffice. Such records are vitally important where they relate to any official decision or decision making process/capacity which is undertaken by an officer of the CSIRO as they are required to justify the end decision. Obviously the senior managers engaging in this activity are not certain that the contents of these records will enable them to justify the end decision, otherwise why would they seek to hide such discussions from proper scrutiny? When it comes to decisions relating to the future of its employees, the CSIRO has a very poor track record in meeting its obligations, particularly in relation to its Enterprise Agreement which underpins the rights and responsibilities of CSIRO employees. One potential reason why such senior managers may wish to hide their discussions is so that they can avoid their lawful obligation under the Enterprise Agreement in advising the CSIRO Staff Association of their intentions relating to a reduction in staff numbers. The decision to hide such discussions may also be a means to avoid engaging in discussions with employees where such decisions are likely to significantly affect the way in which CSIRO employees undertake their work which is also an obligation under the existing Enterprise Agreement which it must be noted the CSIRO has failed to renegotiate with employees since it expired in 2014. In any event, such deceitful practices from Senior CSIRO Management must be ceased immediately and those to be engaging in such practices be made answerable to a charge of misconduct. The use of private email by senior staff to discuss job cuts at the CSIRO “looks like dubious administration” and may be a breach of its code of conduct, the Senate clerk has said. The assessment has prompted the Senate committee examining CSIRO job cuts to signal it will ask the auditor general to investigate senior officers’ use of private email. On Friday, Peter Craig, the director of the CSIRO’s weather research collaboration with the bureau of meteorology, told a Senate committee at least seven people in the CSIRO’s ocean and atmosphere division had used private emails to discuss job cuts because they were directed to do so. In response to a question on notice he added that it was the oceans and atmosphere division director, Ken Lee, and the deputy director, Andreas Schiller, who had given the verbal direction on 28 November. The CSIRO claimed it was meeting record-keeping obligations despite use of private email because it would ensure the emails were entered into its system. In a letter released on Thursday, the Senate clerk, Rosemary Laing, wrote to the Senate committee investigating CSIRO cuts raising concerns about the propriety of using private emails, even if later entered into records. “Although this subsequent ‘capture’ of the records originally conveyed by private email may not be contrary to the requirements of the Archives Act (or national security), it looks like dubious administration and may be a breach of the organisation’s code of conduct by senior staff,” she said. The code states CSIRO staff must maintain “complete, reliable and accurate records of the performance of your work-related decisions and activities” and “ensure the proper storage of, and access to, records, including the confidentiality and security of information”. The Greens senator Peter Whish-Wilson, chair of the Senate budget scrutiny committee, raised that concern at its 8 February hearing. He said “clearly, if private emails have been used, it is going to be very difficult for us to access information” about an executive meeting that decided to make 350 positions redundant. On Wednesday, Whish-Wilson told the Senate full production of documents was needed to assess CSIRO’s restructure and reprioritisation and “to reverse these cuts to the best climate scientists in the world and to increase funding to this critical area of public good science”. The opposition’s innovation, industry and science spokesman, Kim Carr, told Guardian Australia he was “deeply concerned that there is a case to answer as to why CSIRO staff were directed to use private emails”. He said this arguably breached two record-keeping laws and the CSIRO code of conduct. Carr said: “There are still serious questions of public-sector administration that CSIRO needs to answer. CSIRO denied there was a directive to use private emails. At an earlier Senate committee hearing Alex Wonhas, the CSIRO’s environment, energy and resources executive director, said private emails were used to plan job cuts to ensure “information stays within a small group of people to not cause distress and concern among staff”. On Wednesday the cabinet secretary, Arthur Sinodinos, told the Senate he had advice from the attorney general’s office and finance department that CSIRO officials had not breached their obligations. The following article was published on the ABC News website. What is interesting is that the article hits upon the toxicity of such restructures on the organisations already “Toxic” Culture. Little has changed since the CSIRO wasted approximately $4.5 million dollars of Australian Taxpayer money on an inquiry into Workplace Bullying and other Misconduct that failed to find any evidence of bullying because the legal firm investigating was not authorised to do so. It can almost be guaranteed that CSIRO’s “HR Machine” will attempt to turn employee against employee in a rabid frenzy which it has done some many times already in its program of selling off the organisation piece by piece. Australia’s top marine scientists are warning that the country’s international scientific standing will be damaged by the CSIRO’s climate restructure. About 350 jobs nationally are expected to go by mid 2017, including an estimated 100 positions from the Oceans and Atmosphere Unit and 100 from land and water research. A total of 191 staff work in the Oceans and Atmosphere division in Tasmania. Scientific leaders from the Australian Antarctic Division (AAD) and Institute for Marine and Antarctic Studies (IMAS) are giving evidence before the Senate’s Select Committee into Scrutiny of Government Budget Measures in Hobart. The committee is headed by Tasmanian Greens senator Peter Whish-Wilson. Our whole reputation is at risk … our international reputation in delivering results. Senior CSIRO figures have also been called to appear and will give evidence via video link later. IMAS executive director Richard Coleman and the institute’s Nathan Bindoff warned the world was watching. “We know a lot of people on a personal level , which of course is very hard,” she said. AAD head Dr Nick Gales is meeting officials in Canberra today. Outside the hearings, about 300 CSIRO workers and family members gathered to protest against the proposed cuts. 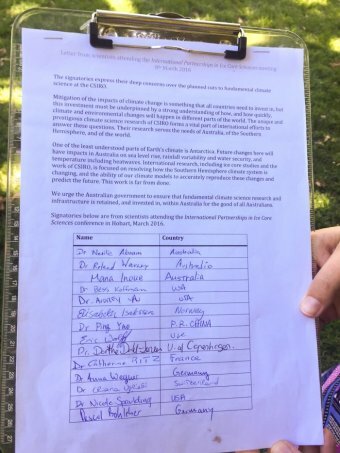 A petition signed by 150 scientists attending the conference has called on the Federal Government to reconsider the organisation’s restructure. The hearing coincides with an international climate conference on ice research in Hobart.